Please call 800-452-7570 to upgrade your subscription. Partly cloudy skies this evening will become overcast overnight. A stray shower or thunderstorm is possible. Low around 50F. Winds WNW at 10 to 20 mph.. Partly cloudy skies this evening will become overcast overnight. A stray shower or thunderstorm is possible. Low around 50F. Winds WNW at 10 to 20 mph. Chad Enderle's known prints were compared to the print found on the cigarette box in Harris' house, and police determined his right ring finger matched. The prosecution presented seven points of similarity between the prints at trial. Several experts say seven points is low by industry standards. 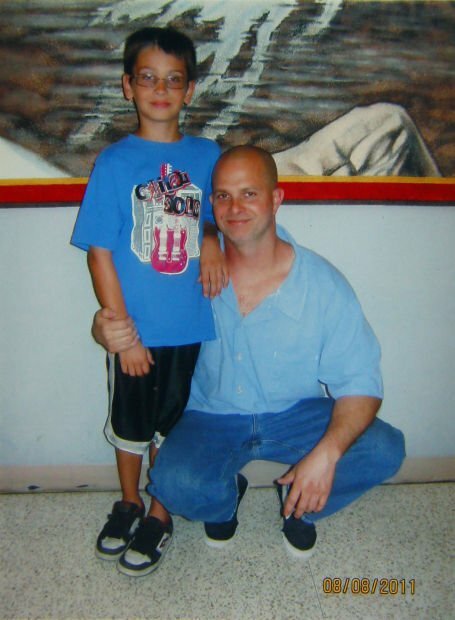 Chad Enderle, then 37, poses in the visitor's room at Iowa State Penitentiary in Fort Madison with his son, Cory. A crime scene technician noted this cigarette pack had blood on its underside, indicating it had been placed on a table near the victim after he had been bludgeoned. Attorneys on both sides said a print identified as Enderle's on the top of the pack was the strongest case against him. A bloody stick was determined to be one of the murder weapons. Three days into the trial, police disclosed a palm print that did not match Enderle's. The student Medill Justice Project team that investigated the Chad Enderle case this fall are, from left, Gideon Resnick, Susan Du, Tori Simkovic and Stephanie Haines. On March 10, 2003, police arrived on the scene of a grisly murder in a dead-end neighborhood: A man who already was suffering from AIDS lay on his living room couch, caked in his own blood from an attack so severe it left little more than half of his face intact. Except for the wound, it looked like a man in a peaceful nap, his legs partially covered by a striped blanket. He was surrounded by a canopy of blood as spatter reached the walls and ceiling. Nearby, police found a bloody wooden walking stick wrapped in a pink blanket on the floor. A crime scene technician picked up a Newport cigarette pack on a side table near Gregory Harris’ head and found blood spatter on the pack’s underside. That offered a clue: The cigarette box “had been moved AFTER homicide,” the technician noted in a homicide report. Later, police found a fingerprint thought to be made in blood on the cigarette box’s cellophane wrapping. The police used the print to place a then 29-year-old named Chad Enderle, who said he sometimes bought drugs from the victim, at the scene of the crime. At trial, authorities highlighted seven identifying characteristics — or points of minutiae — to link the cigarette print to Enderle’s right ring finger. But seven points isn’t usually enough to make a match, according to several fingerprint experts who say the industry typically calls for more. The Medill Justice Project interviewed several fingerprint experts who offered conflicting conclusions. In addition, prosecutors failed to mention Enderle’s print did not match a partial palm print identified on the bloody walking stick — one of the murder weapons — until the third day of the trial . Michael Walton, the Scott County Attorney and lead prosecutor in the case, said in an interview for this article that authorities zeroed in on Enderle when they discovered his telephone records showed he had stopped calling Harris at 5:46 p.m. on the day before the estimated time of death. This could have indicated Enderle knew the victim would not answer the phone, Walton said. The prosecutor also said police called Enderle on March 14, four days after they discovered the victim’s body, and they said he lied about his name, that he did not know the victim and that he did not know the victim’s address. Police also noted Enderle changed his cellphone number 34 minutes after they called him on March 14. Enderle said he did this after he thought he was receiving prank calls. Walton and Enderle’s trial lawyer said the case largely hinged on the cigarette print. “You’ve got a bloody fingerprint in the victim’s blood in a very bloody scene, that’s pretty good evidence,” Walton said. Prosecutors called to the stand three police officers and one lab technician who testified the print was Enderle’s. Ramirez considered calling an expert witness to testify about the print but decided not to when the expert concluded the print was Enderle’s. Enderle is pursuing an appeal with the Iowa Court of Appeals. Since Enderle’s sentencing, studies, federal agencies on forensic sciences and some judges across the country have urged greater scrutiny of fingerprint analysis. Long established as a police technique, fingerprint evidence was born largely as a craft of record-keeping clerks and uncontested until the 1990s but has been increasingly questioned in recent years. In 2010, for instance, the U.S. Justice Department commissioned studies on not just fingerprint analysis but on a broader field of forensic sciences used to identify suspects, including DNA, hair samples and bite marks. Research on the accuracy and reliability of these forensic identification methods shows them to range from statistically reputable to junk science. In 2003, Davenport Police Officer Timothy Brandenburg compared the patent print — a fingerprint visible to the naked eye — on the cigarette box with the known prints of suspects in the case. Brandenburg identified the print as Enderle’s. Lt. Dennis Kern and Sgt. Steven Johnson, certified examiners with Davenport police, confirmed Brandenburg’s findings. Another officer from the nearby Bettendorf Police Department confirmed the print was Enderle’s. The cigarette box also was sent to the Iowa Division of Criminal Investigation laboratory, which confirmed the print on it was Enderle’s. Months later, before the trial, Ramirez hired Ivan Futrell, a Stafford, Va., fingerprint analyst, who had worked at the FBI for 37 years, to examine the print, but Ramirez decided not to call him to the witness stand when Futrell concluded the print was Enderle’s. In an Oct. 31, 2003, deposition, Futrell confirmed he had made a positive identification between Enderle’s ring finger and the patent print on the cigarette box. Futrell also verified that he submitted his conclusion in a report to Ramirez four days before the deposition. “Certainly, (Ramirez) knew the results,” Futrell said in a telephone interview for this article. In a 2012 appeal, Ramirez testified Futrell initially couldn’t make the comparison between Enderle’s print and the cigarette print, so he flew Futrell to Davenport to testify at the trial. Ramirez added that Futrell then had an opportunity to look at the cigarette box or a better quality photograph of the print right before the trial and concluded it matched Enderle’s print. Deciding not to call Futrell to the stand, Ramirez said he did not search for another fingerprint expert to testify at the trial, which began with opening statements Nov. 18 and lasted eight days with closing arguments on Nov. 25, two days before Thanksgiving. “You’re right in the middle of a murder trial,” he said. “I don’t have an army of lawyers to then take that responsibility to find those experts while I’m doing the trial.” Ramirez said the primary focus of his defense was that the print on the cigarette box was made in an unknown substance, which could not be tested because of the damage it would have rendered to the print itself. The substance within centimeters of the print underwent screening tests that indicated the victim’s blood was present. Kent Simmons, one of Enderle’s appellate attorneys, questioned why authorities didn’t test the cigarette print to confirm whether it was blood after they took a photo of the patent print. A bottle of hot sauce sat on a coffee table near where the cigarette box was found. Simmons noted police also had tested Enderle’s shoes for what appeared to be blood but wasn’t. Additionally, Enderle’s van tested negative for blood. Steven Hunter, a Chicago criminal defense attorney with more than 20 years of trial experience, said that because the cigarette box yielded a print with only some points of similarity to Enderle’s, Ramirez could have called an expert to discredit the quality of the evidence. Hunter also said Enderle’s case was tried back when courts nationwide believed fingerprint identification to be largely incontrovertible science, and Ramirez shouldn’t be expected to have had the foresight to defend his client by questioning the foundation of fingerprint analysis. At trial, Davenport police produced an exhibit that showed seven points of similarity between Enderle’s print and the cigarette print. Simon Cole, professor of criminology at the University of California, Irvine, said in an interview for this article that a defendant could have made a persuasive argument in court against the admissibility of a fingerprint with only seven points of comparison. In Enderle’s appeal last year, Kern, the Davenport officer, presented a new exhibit showing 10 points of similarity, not the initial seven, between Enderle’s print and the cigarette box print. Kern testified he presented seven points at the 2003 trial but “I did not say that there were only seven utilized for the comparison.” He said he was trying to avoid presenting a “very cluttered photograph” at trial. Herbert MacDonell, a fingerprint expert in South Corning, N.Y., hired by the defense for that appeal, mistakenly used the walking stick print instead of the cigarette print to conclude the cigarette print was insufficient for identification. In court, after examining the correct exhibits, MacDonell testified he could not match the print on the stick or the cigarette print with Enderle’s print. “I certainly would not consider it a match. I would not sleep nights if I made that match,” MacDonell said in testimony. MacDonell has more than 50 years of experience in forensic analysis and sat on the International Association for Identification’s committee on standardizing fingerprint examination practices. The association, based in Hollywood, Fla., is the oldest and largest forensic identification organization in the world. MacDonell never got certified as a latent print examiner, saying at the introduction of the certification program that he disagreed with the lack of standards. Latent prints are not readily visible. The Medill Justice Project asked several certified fingerprint examiners to conduct their own analyses of the cigarette print, and their conclusions vary. Max Jarrell, a certified latent print examiner at Professional Fingerprint Services in Tullahoma, Tenn., said he could not match the cigarette print with any of the suspects. Jarrell said the examination was inconclusive because the print on the box lacked detail. Robert Garrett, a certified fingerprint examiner at IDMAN Forensics in Denver, N.C., said in a three-page report that the quality of the cigarette print was too poor to identify or exclude Enderle. Garrett, a former crime scene unit supervisor in Middlesex County, N.J., said in a telephone interview that prints made with high moisture, as is the case with the print on the cigarette box, often experience blotting, which distorts the integrity of the print. Dwane Hilderbrand, a certified fingerprint examiner and owner of Forensic ITC Services in Scottsdale, Ariz., concluded the print on the cigarette box was Enderle’s. Hilderbrand, a retired crime scene analyst who worked for 25 years at the Scottsdale Police Department, said in an email that the details of the cigarette print matched Enderle’s print. He declined to elaborate on his email. Gerald Cole, a certified fingerprint examiner in Pompano Beach, Fla., concluded the print on the cigarette box was Enderle’s because it had sufficient quality and quantity for him to make a comparison and identification. “The copy you sent me has the sufficient quality that I can unequivocally go to any court of law,” the retired forensic document examiner for the Secret Service said in a telephone conversation. “If I identify it with the exhibits I had, I can defend it.” Three other certified fingerprint examiners declined to make an analysis, citing what they considered the low image-quality of the photo of the cigarette print. In the late 1800s, British scientist Sir Francis Galton, Charles Darwin’s cousin, explained the uniqueness of fingerprints and developed an identification technique classifying prints using minutiae such as loops, whorls and arches in his 1892 book “Finger Prints,” the first book on fingerprints. In 1894, Galton collaborated with Sir Edward Richard Henry, inspector general of a police department in Bengal, India, to develop an expanded classification system for fingerprint characteristics. That system premiered in America at the 1904 World’s Fair in St. Louis. A British inspector, who learned about the system from Henry himself, spoke to American police at the fair to persuade them to adopt the practice of fingerprint identification. After the fair, he began the process of fingerprinting all the inmates at the federal prison in Leavenworth, Kan., the first collection in the U.S. government’s fingerprint inventory. But it wasn’t until 1911 that print analysis found acceptance in American courtrooms, following the ruling of People v. Jennings, the first appellate case that addressed fingerprint evidence admissibility. In September 1910, an intruder shot and killed Clarence Hiller in his Chicago home, leaving behind three undischarged cartridges, two lead slugs, particles of sand and four left-hand fingerprints in a freshly painted railing . Police found Thomas Jennings wandering at 2:38 a.m. and noticed he had injuries that showed signs of an altercation. When probed by police, he gave conflicting stories, so they searched him and found he had a revolver. Because Jennings had a criminal record, and the Chicago Police Department had embraced new fingerprint practices, technicians from the police department matched the prints from the Hiller home to Jennings. 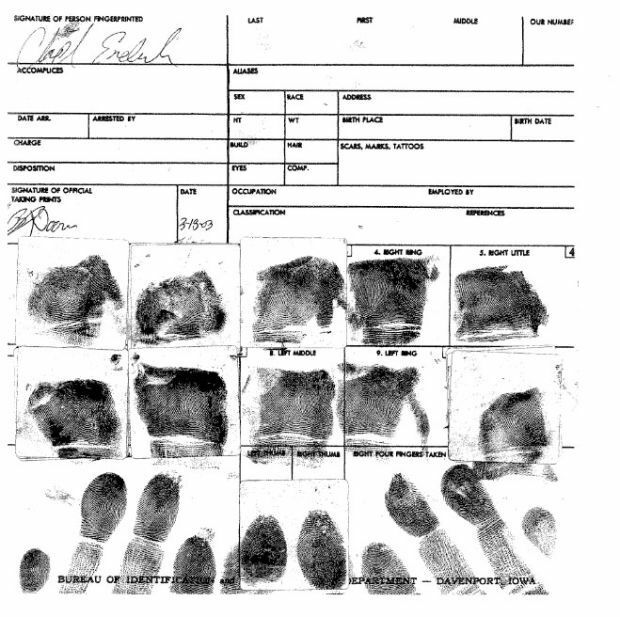 He was tried and found guilty of murder but appealed to the Supreme Court of Illinois, questioning the admissibility of fingerprint analysis as evidence. The court ruled, “there is a scientific basis for the system of fingerprint identification and that the courts are justified in admitting this class of evidence.” This marked the first time fingerprints were used to convict someone in a case with little other evidence. At that time, record-keeping clerks who worked in police departments were the ones manually conducting comparisons and making analyses, according to Cole, the criminology professor. Cole said it was because of the academic origin of fingerprint analysis — and the complex look of it — that the public grew to perceive it as an infallible science. “When you explain it and put up a big image of a fingerprint and say this is a very complex pattern and each of them is unique, a lay person can kind of look at that and believe it can do what it claims to do,” Cole said. A phenomenon some experts call the fingerprint examiner’s fallacy assumes that because each fingerprint is unique, the practice of fingerprint comparison must be accurate. According to experts, this perception fails to account for human error in comparing the prints. That year, Moses contributed to the rise of the Automated Fingerprint Identification System, or AFIS, by procuring for San Francisco police one of the country’s first automated fingerprinting systems, which was developed by NEC, a Japanese information technology company. Moses said San Francisco police saw a 10-fold increase in the number of latent print identifications in 1984, which quickly prompted other state and local governments to invest in automated systems as well. Matches by AFIS can never be exact because of what are called intraclass variations — differences in impressions from the same finger — which occur for a variety of reasons, including smudging and distortion. AFIS can identify two kinds of minutiae, where two lines on a print converge or where a line comes to an end within a print. AFIS then connects the dots between those minutiae to create a geometric shape. It searches its database to find the known prints with the closest matching shape. Different types of AFIS systems use different algorithms to determine how close a latent print is to a known print. For the sample set of known prints provided by AFIS, each score shows the probability that the known print is a match. Analysts then look at each known print and conduct further examinations visually. A bloody walking stick found at the crime scene was the primary murder weapon used to kill Harris, concluded William Wilson , a forensic scientist with the Cook County Sheriff’s Police Forensic Laboratory, who reviewed the crime scene photos as part of an interview for this article. Wilson said the killer finished off the victim with a rock, which police found wrapped in a sweater in the kitchen sink. At trial, Kern, the Davenport police officer, testified he identified one of the fingerprints on the stick as Enderle’s. Police found other fingerprints they could not identify. In a 2003 deposition, Futrell, one of the fingerprint experts who had identified the cigarette print as Enderle’s, said he could not make an identification of the indented part of the fingerprint on the walking stick based on the pictures he had. “You can barely discern any friction ridge whatsoever,” he said. Three days into the eight-day trial , Brandenburg, another Davenport officer, testified there was an unidentified palm print on the stick that could not be matched to any of the suspects in the case, including Enderle. Kern testified he was unaware of the palm print at the time of his deposition in July 2003. The Davenport Police Department declined to comment about the delay in disclosing the palm print. Ramirez said in an interview for this article that he did not know Brandenburg found a palm print on the wooden walking stick until Brandenburg testified about it. Ramirez said he consulted with Enderle about the delayed introduction of the palm print and the two chose to continue with the trial instead of pursue a mistrial. “We decided to use the late revelation to argue the point it was a half-assed investigation,” Ramirez said. Steven Fine, a criminal defense attorney in Chicag , said in an interview for this article it would have been effective to request a mistrial to at least preserve the issue to argue in the event of an appeal. Fine said the unidentified palm print is potentially exculpatory evidence that prosecutors should have disclosed earlier. “It creates reasonable doubt in who is responsible for the murder,” Fine said. Leonard Cavise, a law professor at DePaul University in Chicago, said the government has a constitutional duty to turn over to the defense all “materially exculpatory material,” or evidence that favors a defendant, according to what is known as the Brady Rule. Cavise said a defense attorney can move for mistrial if prosecutors fail to disclose evidence. The defendant’s attorney must demonstrate how the undisclosed evidence prejudices the defendant or would have affected the trial’s outcome. Craig Futterman, a professor at the University of Chicago Law School , said it is important to include on the record how the defendant is prejudiced. He said judges will often deny motions for mistrial. In 1993, the U.S. Supreme Court established the “Daubert standards,” which called on judges to serve as gatekeepers preventing the admissibility of pseudoscientific assertions. The standards — empirical testing, peer review, acknowledged error rate, uniform methodology and general acceptance by the scientific community — alerted fingerprint examiners and other experts to the need to bolster their work as a forensic science. In 2002, a federal judge in Pennsylvania dealt a blow to prosecutors when he excluded expert testimony identifying suspects using fingerprint evidence because the effectiveness of the standard methodology for fingerprint identification had yet to be scientifically evaluated . Still in effect, that methodology requires examiners, for instance, to have their conclusions double-checked by other examiners. The judge ultimately reversed himself, admitting fingerprint expert testimony. The late judge ruled that although fingerprint examination had yet to be demonstrated as a science through research, it had value as a police technique. In 2007, a Baltimore Circuit judge resurrected the fingerprint debate, calling the use of visual comparison of prints unreliable when she disallowed evidence placing a homicide defendant inside the victim’s car. In U.S. District Court, the defendant was indicted and the judge allowed fingerprint evidence, reasoning the standard methodology for fingerprint identification is generally accepted in the scientific community. The Baltimore judge nonetheless has maintained that the fingerprint identification community needs to establish better standards. The judge did not return several requests for an interview. The National Academy of Sciences, created by an act of Congress and comprised of distinguished scholars on science and technology, panned fingerprinting and other non-DNA forensic sciences in a 2009 report. The academy, a nonprofit in Washington, D.C., which advises the U.S. government, criticized fingerprint analysis for lacking the “rigorous research to investigate how accurately and reliably (they) can do what they purport to be able to do” because they “have never been strongly supported by federal research or closely scrutinized by the scientific community.” The report challenged fingerprint examiners to prove the science behind their methods. In 2010, the National Institute of Justice, the research and development agency of the U.S. Department of Justice, awarded $7.1 million to 20 recipients throughout the nation to improve the accuracy, reliability and measurement validity of forensic disciplines. More than $1 million was split among three proposals to study the reliability of fingerprint identification. Tierney, the former International Association for Identification official, noted that in some instances, it used to be that some police officers would be assigned to their departments’ latent print unit as punishment for misconduct in the street. In other cases, officers received fingerprint training only from within their department, thus putting them at risk of inheriting technical mistakes or biases from their mentors. What’s more, Tierney described fingerprint examination as “very close, very demanding work” that can test the examiner’s ability to focus over minutiae over several hours. Neumann, in the February 2012 issue of Significance, a statistical magazine, described a statistical model he developed for quantifying fingerprint characteristics. Neumann said that although it is difficult to summarize fingerprints into sets of data that can be processed using statistics, he compared his model to that used to back DNA identification. Humans have 46 chromosomes and each chromosome has thousands of genes, yet DNA identification relies on a minimum of 16 of those genes. In Neumann’s model, still being tested, the most prominent minutiae in a suspect’s print would be connected to form a polygonal figure. Qualities of that polygon would be assigned numerical values that would render the probability that the suspect is the source of the crime-scene mark. Investigators would in theory use this statistical model after AFIS narrows down a pool of likely suspects and human examiners identify a match. There is something called the “CSI Effect,” a phenomenon that misleads crime-show fans serving on juries who expect forensic evidence to be presented conclusively. A decade after the murder, Enderle said in a prison interview he divides his days in the Iowa State Penitentiary between manual labor for less than a dollar an hour and lifting weights and swinging at a punching bag, his mind not far from his case. Other times, he goes to the prison library, in which there is a section devoted to legal texts, reading and rereading court documents to the point where he can recite passages from specific page numbers of his trial from memory. “On a daily basis for the past six or seven years here, I was in the law library every day looking up law reviews and talking to other people to learn the system,” Enderle said. He said he didn’t know enough at trial about legal procedure to properly weigh the significance of the unidentified palm print. As for the cigarette print, he’s still frustrated it was never tested for blood. Though books in the prison library are outdated by more than a decade and he doesn’t have access to the Internet, he said he has researched all he could about forensics and criminal law over the past several years. March 6, 2003: Police say Gregory Harris, 45, of Davenport, was killed in his home. Vote for an amazing nurse now! Nursing professionals make an impact on our lives, our loved ones and our community every day. Now is the chance to honor exceptional professionals who have inspired with their comfort, skill and dedication. Call Seither & Cherry for all your industrial equipment installation needs, (319) 524-5472! Is a Criminal Defense Case slowing down your life? Find out what Graybeard Investigations can do for you!